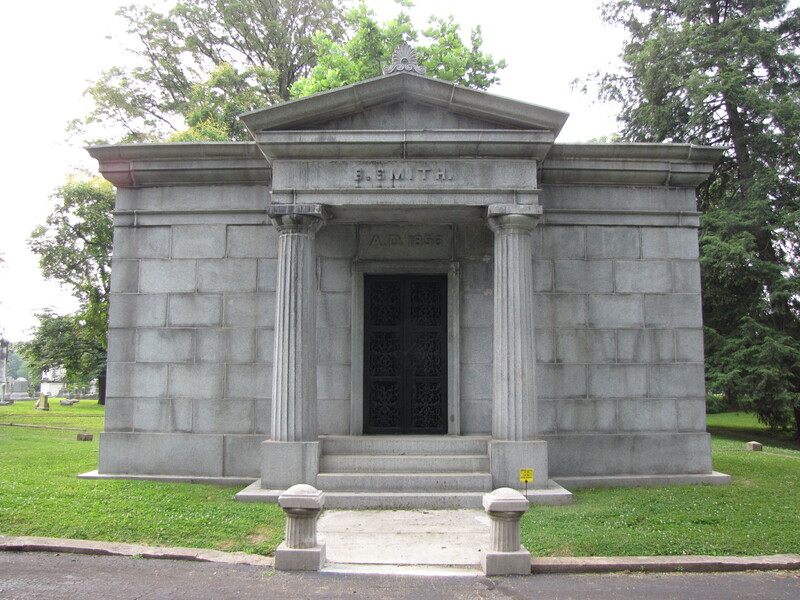 The Earthly remains of Benjamin and Irene Smith were laid to rest in a solemn and gray granite Greek revival-style mausoleum. The mausoleum is of the Doric order—characterized by the fluted columns with no base resting directly on the stylobate, slightly curved and unadorned capital. The architrave (stone panel that traces around the building just above the column) is truncated and plain, as is the frieze which is generally enhanced with trigyphs and bas-reliefs. The cornice (the triangle-shaped architectural element above the door) is topped with an acanthus stone work called an acroterion all which completes the plain and solemn tomb. The austere outside of the tomb in no way prepares you for the statue that you will see if you peer through the iron grill-work door. Inside is a finely-carved marble statue, produced by German-born artist Emile Wolff, of the boy from the mythological tale of Hercules and the first of the twelve labors. In that Greek myth, Hercules was tasked with slaying the Nemean lion, a ferocious and seemingly indestructible animal that was tormenting villagers from the town of Cleonae. A small boy from the village pleaded with Hercules to slay the beast and said if Hercules was able to do the deed the villagers would offer up a sacrifice to Zeus in his honor. Hercules was able to pierce the lion’s impenetrable skin with its own claws defeating the lion. Hercules skinned the lion and took back the animal skin to show the villagers that the lion was dead. 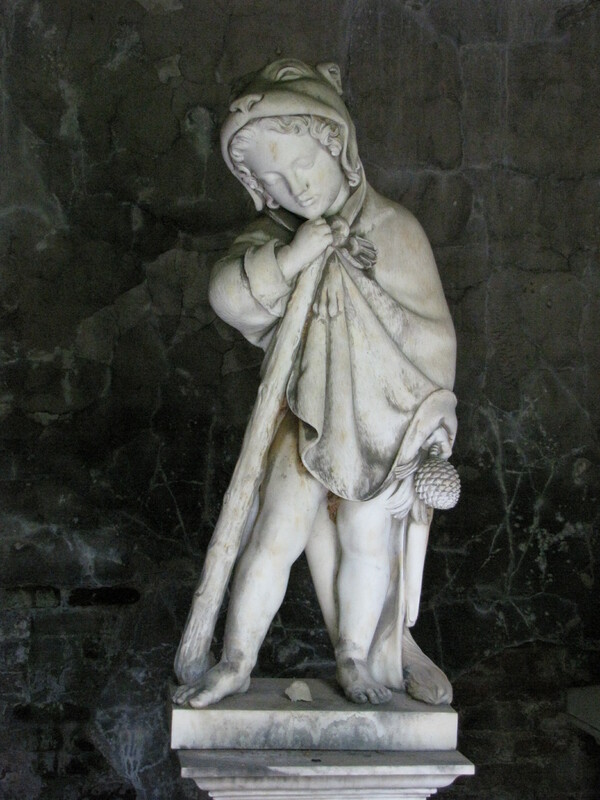 Here the boy in the sculpture wears the lion skin. What is unclear is the significance of the statue to the four people—Benjamin and Irene Smith and Frances “Fanny” Smith Bullitt and Alexander Clark Bullitt—laying in repose in the mausoleum. This entry was posted in Mausoleums. Bookmark the permalink.